Traveling from Tuscany, Italy to Oslo, Norway on Thursday was a fun lesson in latitude for all of us. The same sun shined on both, but the resulting temperature at the ground level was quite different. We left 95-degree sunshine, and landed in 60-degree sunshine. Packing lightly for our three-week trip did not consider these extremes for July! The biggest difference was that in Norway, the sun shines until 11pm! And rises again at 3am, which I guess is normal this week after the longest day of the year. Friday, we took a cab to the Viking Museum, and were amazed by the size of the boats, and the intricacy with which they were decorated. 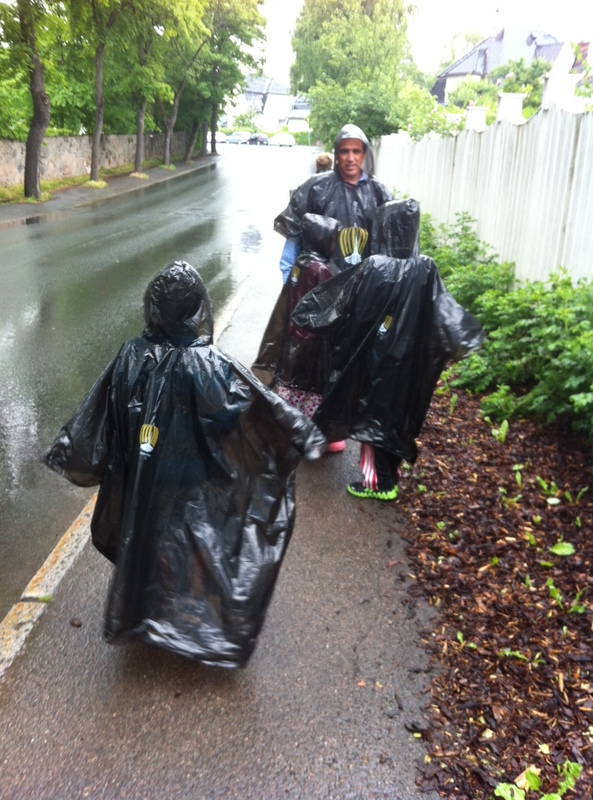 We bought appropriate souvenirs: rain ponchos. Thursday’s sunshine was only internal now. The Brady Bunch walked to the “Taxi stand” to wait – following the directions of the cab driver who had dropped us hours before. 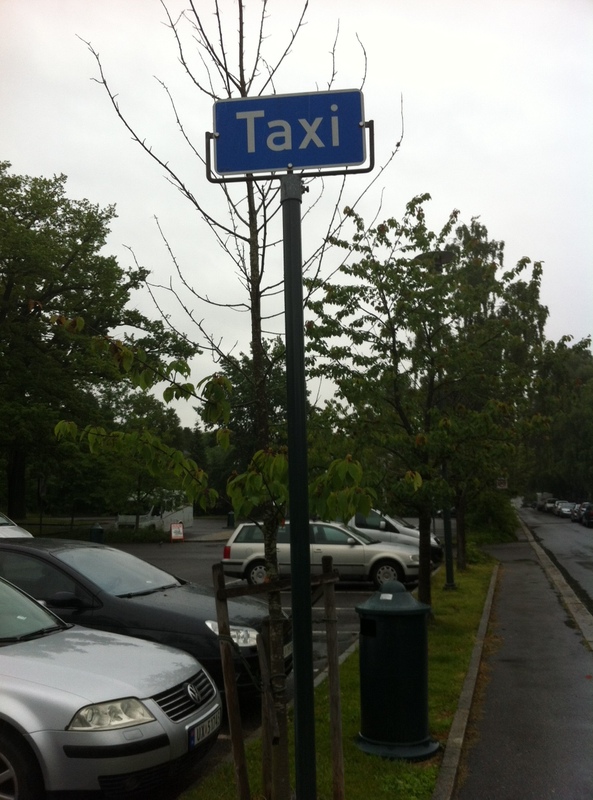 We soon learned that the sign which read “Taxi” was really where taxi drivers drove by and waved to the family of 6 standing in the rain. After twenty minutes, Chris approached a cab who stopped, and the driver explained he was picking up someone else. 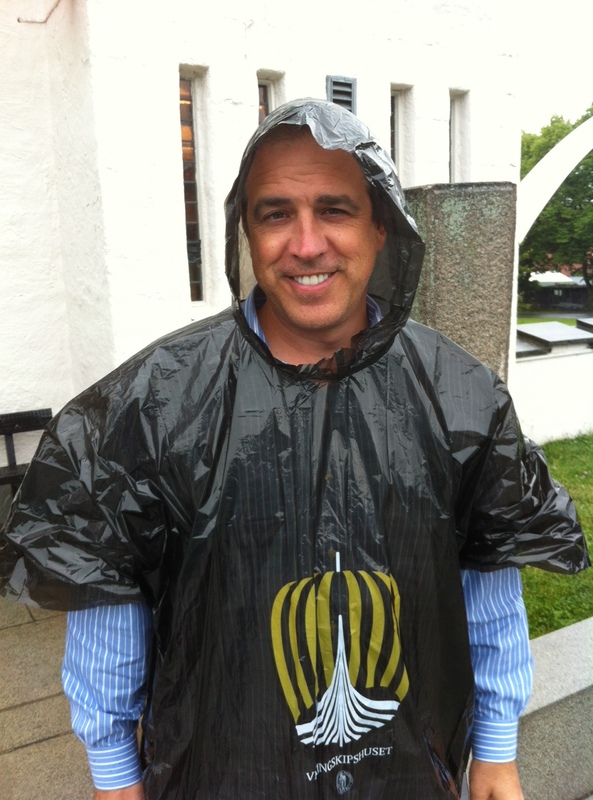 “Would you please call one of your partners for us?” Chris asked as rain poured from his poncho onto his face. The man agreed, and we went back to obediently waiting under the promising sign. Another twenty minutes and the kids were getting giddy and putting up thumbs for hitch-hiking. I had started jumping jacks to keep warm, but tucked my hands and Italian leather purse inside of the poncho, wishing I had thought to buy two. We have discovered that Norwegians speak better English than anyone we know who has it as a second language. It really has made it easy for us. However, they don’t write English on much, so signs are almost impossible. I had bought a bottle of hair spray, but then I got worried that I was spraying deodorant or bug spray on my head before meeting our business partners here. The written instructions regarding public transportation were similarly foreign, but I caught a number off of a car: 02323. I picked up my iPhone and dialed. A recording answered and said something like, “I am kiking yur but” but I am sure that is not what it meant. I hung up and dialed again several times, but the same message repeated. By now, an hour had passed and Chris was ready to hire the next person who walked into the parking lot to retrieve his personal car. She then promptly called the cab company (I watched her dial 02323), waited on hold 10 minutes, (I imagined the recording saying, “I am kiking yur but,” which probably translated, “Please hold on, we will be with you in a moment.”) while I stood and admired her store. Finally, she handed me a piece of paper with a confirmation number and told me the cab would be there momentarily. It was so true! Why do I hesitate to ask for help, when I absolutely would help someone if they were “in my comfort”–if only I would open my eyes more often to take note of someone’s “comfort”? This entry was posted in Rooted in Faith, Sister to Sister, Travel, Uncategorized and tagged A month of Italy, art of vacation, Chris Brady, vacation by Terri. Bookmark the permalink. I absolutely love how I can be just sitting here with my son 🙂 reading your blog and start laughing so loud I’d swear the neighbors can hear me!! They say laughter is good for the soul…therefore, YOU are good for MY soul!! I can’t tell you how much I look forward to reading your blog! You have such a way with words, both written and spoken! Thank you for all the laughter and learning!! You are a true inspiration! Good point Terri! I remember one time going to a public restroom in Budapest & not being able to read the sign outside the door! I only knew that I was in the right place based on the international “women’s” symbol at the door. Unfortunately, I didn’t discover that I was suppose to pay for sheets of toilet paper BEFORE I entered until it was too late, lol… Thank God my friend being aware of the situation was there to help me out! 😉 Fun memories!!! I love the Adventures and lessons that come from the mishaps on all your trips! Thank you for sharing! I can certainly open my eyes more to those in my comfort! Thank you for sharing a story with such simplicity, but with great lessons of patience, and being willing to ask for help. Kudos to your kiddos for a good attitude during such a long wait! Thank you so much Terri for this post. I lived in Oslo for 10 months. I so remember this time of year- no real dark just twilight. The norgewians are great people. Enjoy the rest of your stay. Terri, You are so right, if only we would reverse the roles during times like these we might not wait so long to seek answers. Everything happens for a reason and this memory created a great story and lesson for all of us. I just love your transparency! God Bless you!! What a very nice reminder, Thank you for sharing. I guess traveling “comforts” happen to the best of us. Thanks for the story! What an awesome post Terri. I remember when I was younger, someone told me, “Never hesitate to ask for help, because you open an opportunity for the other person to be of help”. Ever since, I seldom hesitate to ask for help, knowing that it can be an occasion for another to do good. Thanks for sharing your travel experiences. God bless! “in your comfort” — wow, what a thought. It is easy to not notice people that are not in their comfort when we are in ours. Your story made me want to be more observant every day of people who out of their comfort that I can reach out to while in mine. Thank you! It truly is amazing where God shows up in our lives. We also, hope that we can be as kind to others as they were to us last weekend during our traveling troubles too.